Just around the corner of Amsterdam you’ll find beautiful Dutch tulips in the Keukenhof, Dutch windmills at the Zaanse Schans, Amsterdam Castle, cute Dutch fishing village called Volendam or the history rich city Brussels in Belgium. Here is our top 5 of places to visit outside of Amsterdam. When you visit Volendam you’ll be transported back in time, Volendam is well known for its old fishing boats and the traditional clothing still worn by some residents. Although there are many traditional Dutch constumes, the traditional constume of Volendam is one of the best known in Holland. Try the Volendam costume and get your picture taken! Foto De Boer has been taken pictures since 1925. Volendam was by origin a Dutch fishing village, because of its insulated location Volendam has preserved its character for over a few hundred years. In Holland Volendam is also known for it’s ‘export’ of singers. A lot of current Dutch singers were born and still live in Volendam. Watch the video to get en impression of the village Volendam. The Dutch love to eat raw herring, they also call it: ‘Haring happen’, which is a bit difficult to translate, because you would be saying ‘eating herring’, but we wouldn’t do it justice. ‘Haring happen’ refers to the method of eating the herring. The Dutch hold the herring above there mouth and eat the herring. Every year the first barrel of herring is being auctioned, this year the first barrel was sold for € 65.000,-. Watch the video from 5:26 on how you can eat a herring the Dutch way. When you visit Volendam you can also visit the peninsula Marken which is close by Volendam, there is a regular ferry connection to Marken. Edam is a village very close by Volendam and is known for its cheese among other things. Volendam and Edam form a municipality Edam-Volendam. In the 16th century the cheese market was the primary resource of the economy in Edam. There is also a cheese called the Edammer kaas (kaas = cheese). Commercial cheese markets were held in Edam until 1922. Local farmers would bring the cheese to the market via little boats, the cheese was carried to the market by cheese sledges, merchants checkt the cheese and tested them for their quality and finally the cheese was brought to the warehouse where the cheese was kept until the quality was at its best. Since 1989, the cheese market in Edam has been revived as a re-enactment for tourists. It is held each July and August on each Wednesday. Windmills is still a common sight all over The Netherlands, from the traditional old windmills to the new modern windmills. You can see traditional homes form the 18th and 19th century architecture, including several functioning windmills. You can watch live demonstrations of craftsmen at work, including a clog maker crafting the famous wooden shoes of the Netherlands. Sounds fun right? But, how do you visit all three places in one day? Book a bus tour and visit Volendam, Edam and Zaanse Schans. Click here for more information. The medieval centre of Bruges has been listed by UNESCO as a World Heritage Site. Bruges is like an open air museum, you’ll see alot of old small streets, cute shops and beautiful old houses. Some parts of the city are partially or all together closed off for vehicles, this gives you more freedom of movement. Stop by a chocolate shop, eat waffles, enoy a typical Belgium meal like mussels or fries. Dine on a typical Belgian meal of mussels, frites, and as desert: waffles! Visit Brussels from Amsterdam. Click here for more information. 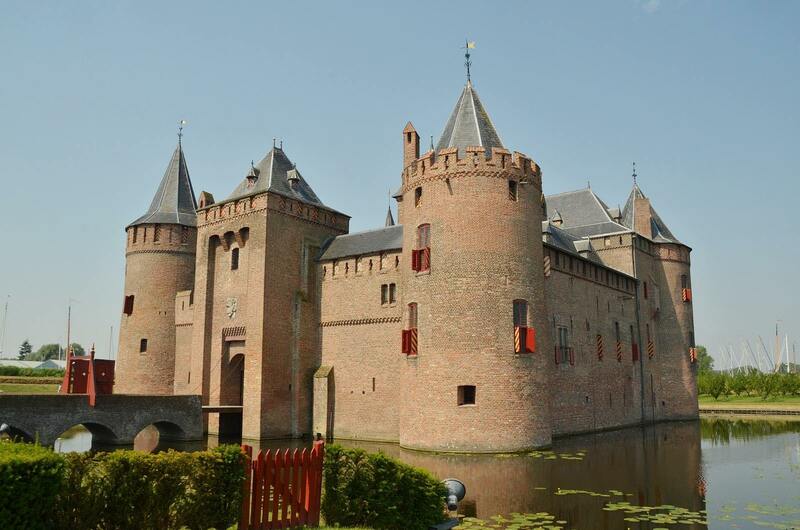 Amsterdam castle is actually called Muiderslot. Amsterdam Castle is located in Muiden, east from Amsterdam. It’s called Amsterdam Castle for promotional purposes, but it’s a real castle commissioned in 1280 by Count Floris V and is part of the UNESCO-listed Defence Line of Amsterdam. Click here to go to the I amsterdam website for more information. Shopping at Batavia Stad Fashion Outlet is a fabulous experience and a wonderful day out. This charming, reconstructed seventeenth-century village is a shopping Valhalla for people who love to make a statement with their outfit as well as people who prefer quality basics. More than 250 international fashion & lifestyle brands like Hugo Boss, Michael Kors and Tommy Hilfiger are waiting to inspire you with the latest trends, must-have items and more. Click here for more information. 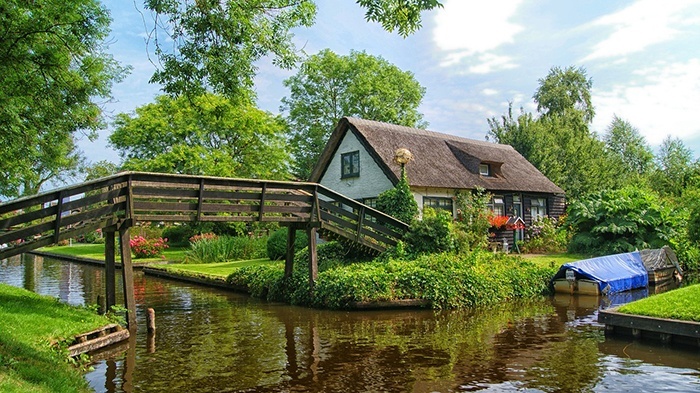 Giethoorn is a Dutch picturesque village whithout any roads. The houses are located on a piece of land in the middle of the water. It’s like a Dutch Venice and has become very popular among tourists. Click here for more information.